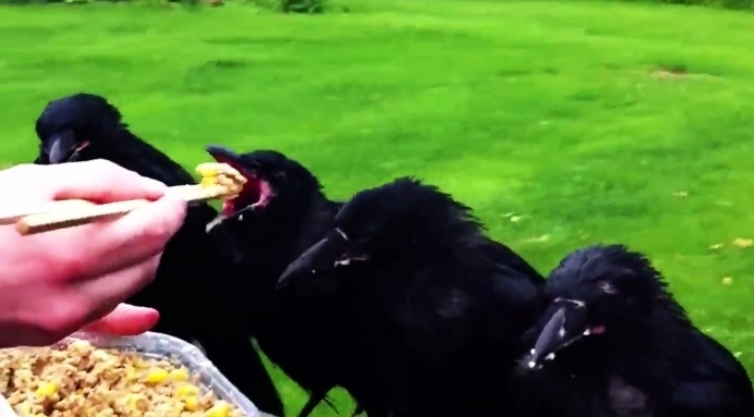 A quartet of orphaned crows raised by a veterinarian and her family still visit their adoptive clan to say "Hello" -- literally. A video going viral online explains that the four young crows had fallen from their nest and were turned over to a veterinarian named Kristy to raise with her family. The video says the crows were all initially called Fred, but their names were later individualized to Baby Fred, Russell Crow, Adventure Fred and Crow Magnon. The family introduced the intelligent birds to berries and worms in the hopes they would one day be released into the wild. The birds, which have an intelligence on par with chimpanzees, learned to say "hello" from the family. The crows grew independent and were eventually accepted into a family of wild crows, but Kristy and her family said the Freds still make visits to their home to say "Hello." What’s truly incredible about these crows is that they even learned how to say “Hello” to their people without any provocation to do so. They also used to bring presents of leaves and worms to the humans when they were learning to hunt and gather. Did You Know? : Wild crows can recognize individual people. They can pick a person out of a crowd, follow them, and remember them — apparently for years. 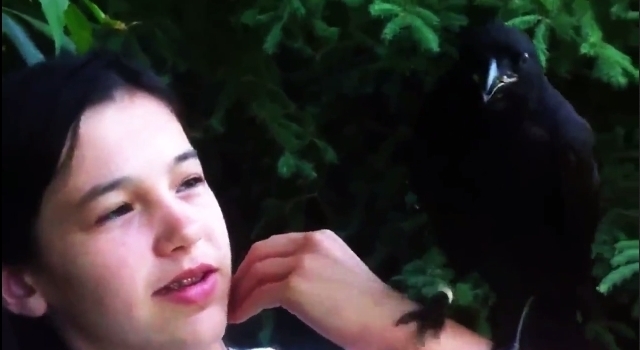 But people — even people who love crows — usually can't tell them apart. Responses to "Orphaned crows released into the wild still visit family to say 'hello'"
I feed and water the birds in the winter.. My trees are all bird friendly. I was put off by the crows getting to the food before the smaller birds. but hey, crows got to eat too. I have several feeding stations where I throw the food on the ground. squirrels have buried a ton of sunflower seeds and grapes. they won't be happy come spring. a flock of grackles had a good time for 2 days. now 24 inches of snow is falling.. come on spring!